at the New York Consulate. 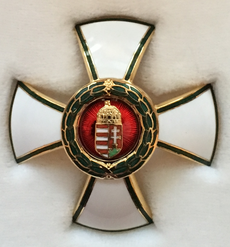 At the remembrance AHF Co-President Gyula Elemér Balogh, President of the Amerikaiak a Magyarokért Alapítvány in Hungary and President of the Hungarian Innovation Center in NJ, received the Hungary Order of Merit Officer's Cross award signed by the President of the Republic of Hungary. 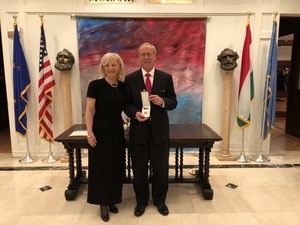 Mr. Balogh in his acceptance speech of his award for service thanked President Áder and Dr. Vizi E Szilveszter President of the Friends of Hungary Foundation and Past President of the Hungarian Academy of Sciences who recommended him. He sadly remembered being 12 years old when the 1956 Revolution took place and being unable to help the Hungarians from the US. This left a lifelong impression on him and he vowed to help Hungary whenever he could. 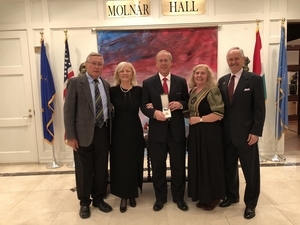 Five AHF Board members were present at the 1956 Remembrance: Zsuzsanna Dreisziger Stricz, Dr. Judit Kerekes, Nagy Akos, Dr. Imre Nemeth who flew in from Washington DC for the event, and Mr. Balogh. There were moving tributes to the 1956 martyrs. 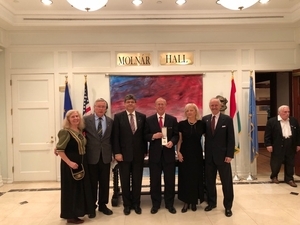 Mr. Balogh mentioned standing up for Hungarian minorities while a student at Columbia University by serving as a spokesman for the Committee for Human Rights in Romania at demonstrations against the Romanian Dictator, and walking the floors of Congress with fellow Committee members to stop most favored nation status for Romania. 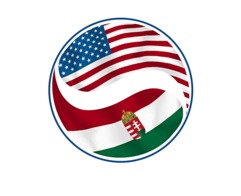 He was President of the Hungarian Reformed Federation of America from 2005-2008 and the Kossuth House in Washington DC. 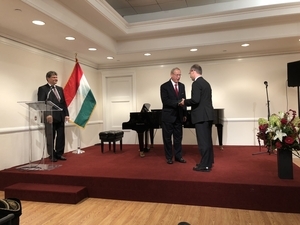 He was in Hungary in October 2006 when the MSZP party in power shot at their own countrymen at demonstrations, and stood up on the podium at a counter demonstration and vowed again that he would come back and help Hungary. 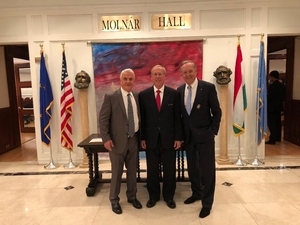 Continuing his ancestors' more than 200 years of service to Hungary, at his father Dr. Elemer Balogh's request, he returned to Hungary in 2009 and started the Amerikai Magyar Klub and the Amerikaiak a Magyarokért Alapítvány (Americans for Hungarians Foundation), whose past 9 years of achievements can be seen on the AMKL.org web site.